This is, in fact, not the kit I originally ordered. To make things easier on my novice self, I ordered a kit with bolt-on necks. But then the company emailed me saying they had made an inventory error and they were out of the bolt-ons. Could they send me this other kit instead? “This other kit” happens to have set-in necks. 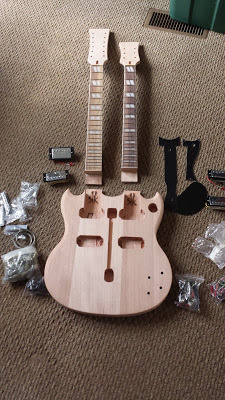 After a bit of back-and-forth (I asked them, among other things, if they thought a total novice could handle assembling set necks), I told them to go ahead and send it, I would give it a try. They said if I found out I couldn’t handle it, they’d let me return it to them, even if I’d begun finishing, etc., so that was nice of them. Now all I have to do is put it together without screwing it up. Stay tuned for updates as we go along.